While things at St Andrew’s Trillion Trophy Stadium have been much calmer and less chaotic than our friends over the expressway, there still remains a slight cloud of secrecy over just where Blues are going. While no one can fault the amount of money put into the club by the owners, the communication between those at the top and the fans is still virtually non-existent. Margaret Decker of Blues Trust and I have travelled to Hong Kong to do what we think personally is the right thing to try to improve the situation. I should make it clear from the outset that we’re not here to speak on the behalf of “the fans”. We both understand that we can only speak for ourselves and do what we believe is the right thing. I should also make it absolutely clear that our trip has not been funded by the Trust, but by a benefactor who wishes to remain anonymous at this time. Our visit to the Birmingham Sports Holdings offices in Vertical Square was for two reasons. First off, Margaret and I wanted to give to the board a copy of “Engage! How Clubs Can Win With Football Supporters”. This is a publication by Supporters Direct outlining how it believes clubs can better engage with fans. I’m pragmatic enough to know that supporter ownership is not only unlikely but is also very problematic at Championship level due to the investment required. However, the section in the publication about how structured dialogue can help clubs and fans is something that I feel is achievable and would be best for all parties. It’s important to provide supporters with the opportunity through structured dialogue to learn more about the business model of their club and the constraints under which the board operates. As an example, I’d like to see a situation where the club feel they can be honest with us and tell us that there may not be huge amounts of money to spend rather than feeling they have to employ marketing promises so we will buy tickets. Believe it or not, I want the board to be successful. If the club is healthy, then their business is healthy. I’ve long said that I would rather see the club able to run itself than depend on their infusions of cash. I know that it’s probably unlikely that right now the board will take any notice of the two of us. However, my own personal view is that right now so little is known about what is going on that any communication would be a good thing – and if I can help get that process rolling, then I’m doing the right thing. The second reason I came out here was to try and get a better perspective of how things are and to try to share that here. I have to admit it was a pleasant surprise visiting the offices. 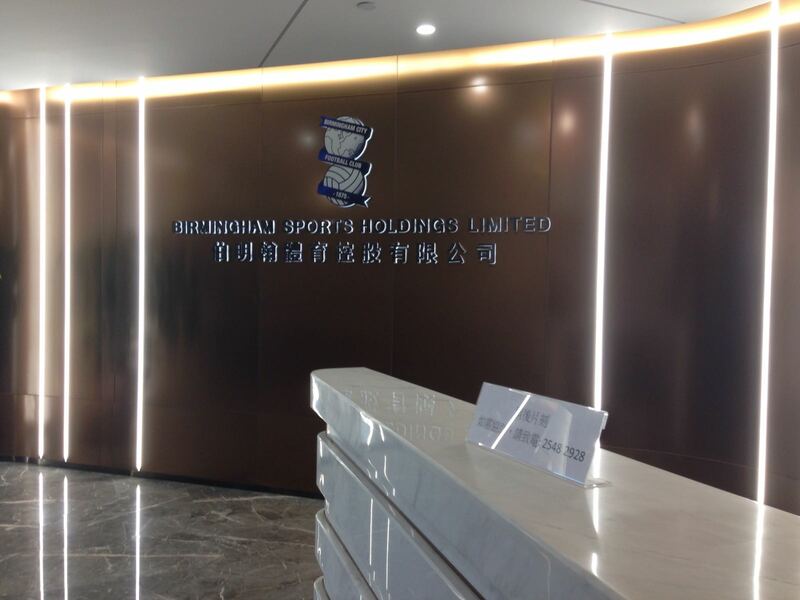 Unlike my previous visits to Hong Kong, the new offices of Birmingham Sports Holdings genuinely look like the office of a company that owns a football club. There are framed Blues shirts on the wall while televisions in the reception area quietly play scenes of our success both past and present. We were shown a room where directors, management and their guests gather to watch Birmingham City games on a huge TV with a nicely stocked bar in the corner. It felt like that they were genuinely proud to own Blues. Seeing the office has also reaffirmed my belief that when time does come to move on, Paul Suen will sell not BCFC but his shares in BSH (or even just TTA) to new owners. Suen has righted the ship and turned the holding company into a worthwhile investment. Now the office has been set up to entice investors into investing in Blues. If, as it appears almost certain, Blues are to remain under HK / Chinese ownership, I think that it’s probably good for us to do more to understand what the constraints of that are and what to expect. We’ll be out here for a week. While we’re here we’ve got interviews lined up with Chinese football and business experts to help us to understand more about the constraints HK / Chinese owned clubs might have such as restricted movement of money; and I’ll be doing my best to find out more about the “faceless four” of major shareholders in Birmingham City to share on this website.